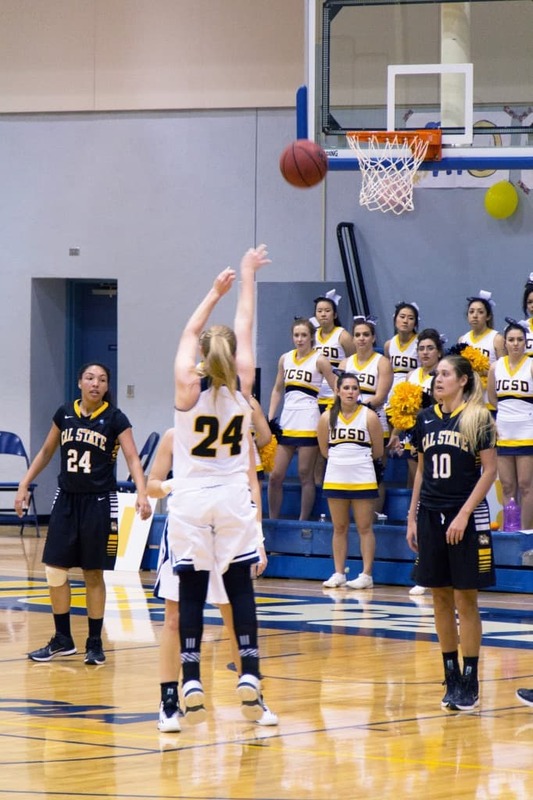 UCSD’s basketball teams both fell in the opening round of the CCAA championships, the women defeated 69-58 by CSU San Bernardino and the men edged 61-46 by CSU Stanislaus. Cal State San Bernardino brutally snapped UCSD’s seven-game win streak in the first round of the California Collegiate Athletic Association postseason tournament in Stockton, California. The fourth-seeded Tritons ended their season on a devastating 69–58 loss to their fifth-seeded opponent and conclude with an 18–10 record in conference play. UCSD got off to a hot start, with sophomore guard Haley Anderson and senior guard Stephanie Yano each sinking a three-pointer to take a 6–0 lead. The Tritons took their biggest lead of the game when junior forward Farrah Shokoor made a layup with 11:28 left in the first half to take a 16–9 advantage. 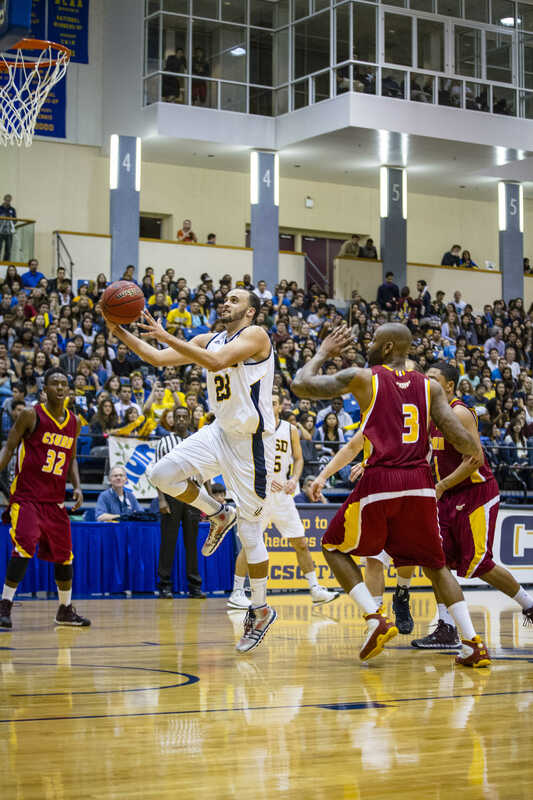 However, UCSD subsequently allowed an 8–0 Cal State San Bernardino run in three minutes and relinquished the lead. The two teams went back and forth for the rest of the half. Sophomore guard Beth Mounier hit a three to put the Tritons ahead 32–30 with 10 seconds left in the half, and Shokoor blocked the Coyotes’ last three-point attempt as UCSD took the two-point lead into halftime. The tide turned in favor of Cal State San Bernardino in the second half. Helped by a 13–4 run, it grabbed a 54–47 lead with 10:19 left. UCSD did answer with a 9–2 run, tying up the game at 56 when Mounier scored a layup with only 5:48 remaining in the game. However, the Tritons could not get anything else going in the final minutes of the match, and Cal State San Bernardino finished on a 13–2 run to clinch the win and a spot in the conference semifinal against Cal State Dominguez Hills, the top-seeded team in the CCAA. “I thought we got good shots, [but] we didn’t make enough of them,” VanDerveer said. “Sometimes we got a little rushed from the defensive philosophy that they played, and then we didn’t get enough stops and rebounds on the other end. While Cal State San Bernardino improved its shooting over the game from 43 percent (13–30) in the first half up to 54 percent (13–24) in the second, the Tritons went the opposite way, going from 50 percent (13–26) down to only 34 percent (11–32) shooting in the second half. Cal State San Bernardino also outrebounded the Tritons 38–29 and netted 14 of its 15 free throws. UCSD was just five for nine from the line. In the last game of her season, all-CCAA first-team Shokoor had 11 points and a game-high 14 rebounds, good for her 15th double-double of the season. She also had four assists, three steals and two blocks. Mounier was the only other Triton in double-figures, with 11 points. Senior forward McKennan Bertsch, senior guard Miranda Seto (who both received all-CCAA teams honorable mentions) and senior center Dana Webster all had eight points, in what was the last game of their collegiate career. After clinching its eighth consecutive playoff berth, UCSD fell disappointingly in the opening round for the second straight year. Top-seed Cal State Dominguez Hills defeated sixth-seed Cal State East Bay in the final, earning its second consecutive CCAA tournament championship. With six departing seniors and only two returning starters, UCSD is looking ahead to an offseason full of unknowns. Under the leadership of Shokoor and rising stars Mounier and redshirt freshman guard Taylor Tanita, the Tritons still have reason to expect another playoff-caliber year in 2016. However, building a deep squad capable of coming up in the clutch moments of the postseason still remains a question mark for the next campaign. The UCSD men’s basketball team’s season came to an end Thursday night as the fifth-seeded Tritons were defeated 61–46 by fourth-seeded Cal State Stanislaus (14–8) in a first-round matchup of the California Collegiate Athletic Association postseason tournament. In its first two regular season meetings against Cal State Stanislaus, UCSD struggled to shoot the ball, converting a dismal 36 percent of its shots. Thursday’s game was no different as the Tritons were again cold from the field, making only 33 percent of their shots. Only one Triton — junior forward Drew Dyer — finished in double-digits scoring. Dyer led the team with 10 points and eight rebounds. He also had three assists. “Probably not our best performance and, unfortunately, the timing of that is not ideal,” UCSD head coach Eric Olen told the UCSD Athletics Department. “[Cal State Stanislaus] deserves a lot of credit for that; they’re a really good team. Junior guard Hunter Walker had a season-low three points on 1–8 shooting. Coming into the game, Walker led the Tritons in scoring, averaging 12.6 points a game. He did, however, grab seven off the board. Despite the tough shooting night, UCSD had the slight advantage in the first half, largely due to its three-point shooting. The Tritons went 4–9 from beyond the arc in the first half and were able to take their largest lead of the night at six points. Later, UCSD took a one-point 25–24 lead going into intermission. Cal State Stanislaus wasted no time after the break and took advantage of UCSD’s shooting woes to start the second act with an 8–2 run. The Warriors would roll with the momentum, following up with a 9–0 run to push the lead to as high as 17 points. On the other end of the court, UCSD shot 1–10 from deep. Sophomore guard Adam Klie’s 11-game double-digit scoring streak came to an end Thursday night. He scored eight points and corralled four rebounds. In addition to the Tritons’ poor offensive shooting, the Warriors were able to dominate the paint, especially in the second half. The Warriors outscored the Tritons 28–16 down low while also holding a 38–29 advantage on the glass, which lead to 15 second-chance points for the Warriors. For the Tritons, the loss marked the second lowest point total of the season at 46. For Cal State Stanislaus, the win marked the third victory over UCSD this season and the Warriors’ 10th win against UCSD in the last 11 meetings. The Warriors were eliminated the following night by first-seeded Chico State. Second-seeded Cal Poly Pomona would eventually defeat Chico State in overtime for the 2014–15 CCAA crown. The Tritons end their successful year with a 16–11 record, the most wins since the 2008–09 campaign. Despite having no seniors on the roster and being projected to finish ninth in the CCAA, the Tritons finished fifth.